This image was pulled from Snapchat and shared by La Villita, Chicago. We are alarmed that Sheriff Tom Dart appears to have incarcerated people outside Cook County Jail and shoveling snow without proper winter weather attire. Any labor from prisoners should be safe, completely voluntary, and compensated at no less than minimum wage. We hope the Sheriff’s Office will provide the public with information about what is going on here and how these folks are being treated. 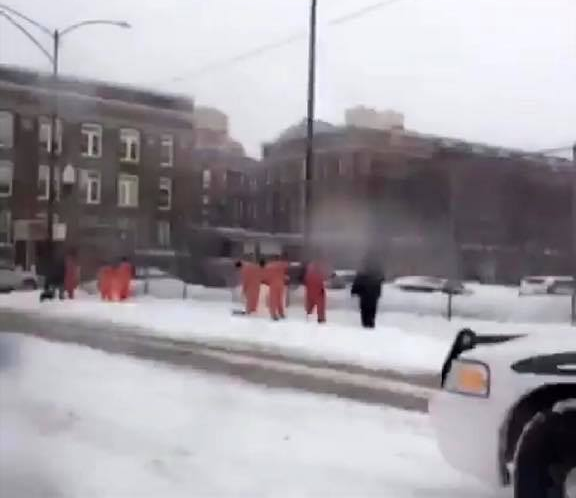 Yesterday, we shared an image of people incarcerated in Cook County Jail shoveling snow. “There are always concerns about the conditions under which prisoners work, said Sharlyn Grace, co-executive director of the Chicago Community Bond Fund. So when she saw the photo, it raised questions about whether the work was voluntary, safe and compensated sufficiently. ‘I don’t think that anyone is seriously suggesting that shoveling snow is a skilled form of labor that’s going to lead to job opportunities upon release,’ she said. Read more in the Chicago Tribune by clicking here.